Lucky Supermarkets has kicked off a campaign to educate customers about plant-based foods at its 70 stores in Northern California. Working with the Plant Based Foods Association (PBFA), Lucky stores will promote and provide education for 16 of the association’s member brands that are sold in the chain’s stores. The goal of the campaign, dubbed “Fall in Love with Plant Based,” is to build shopper awareness of the variety of plant-based foods available. Lucky supermarkets, part of The Save Mart Companies, will have seven advertising stands located in- store to showcase plant-based food options at each location. Educational booklets with coupons will be available at all stores. 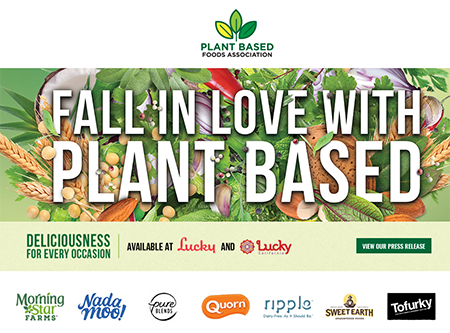 In addition to screen ads at checkout and breakroom television content to further educate staff about plant-based foods, Lucky and PBFA also will promote Fall in Love with Plant Based on social media and radio. This week, the retailer’s Lucky You Rewards app-based loyalty program will offer special discounts for PBFA member-brand foods. Plans call for select Lucky stores to also hold in-store tastings with plant-based foods on Nov. 3 and 4. PBFA noted that many consumers are seeking better-for-you food choices and see plant-based alternatives to meat and dairy products as a way to help maintain a healthy diet and protect the environment. “There is truly a plant-based option for everyone,” Simon commented. The campaign is scheduled to run until Dec. 2. Participating PBFA member brands include Almond Breeze, Beyond Meat, Califia Farms, Daiya Foods, Follow Your Heart, Forager, Good Karma Foods, Lightlife Foods, Milkadamia, Morningstar Farms, NadaMoo!, Pure Blends, Quorn, Ripple Foods, Sweet Earth and Tofurky. “We look forward to building on this exciting partnership with Lucky Supermarkets,” Simon added.